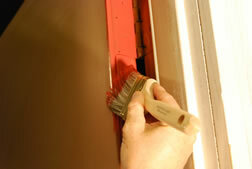 Don’t be afraid to tackle paitning that flat surfaced door because it’s easier than you think…just follow these steps! Before I start talking about painting doors, I want to pass on that one of the easiest and inexpensive ways to freshen up a room is to paint your walls and trim. Let’s face it; dollar for dollar a gallon of paint is one of the most versatile decorating tools available. However, if you’re working on a painting project and you have decided to paint your door trim, somewhere down the road you’ll be tempted to paint your doors as well, especially if you have a plain honey oaked colored luann door. Most of the time folks choose to leave them alone, because if you paint them once, from then on the doors will have to be painted, so before you read further into this article, make sure that you really want to paint your doors. 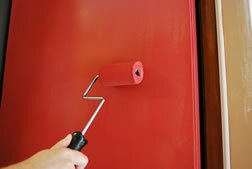 Now, as uncomplicated as it may seem, painting doors can be a little tricky especially if you want nice even paint strokes without a lot of drips and sagging. The secret to any painting project is in the preparation. 1. First, remove any hardware that you can. If you feel comfortable removing the doorknob, do so. If you can’t or if it is being stubborn, tape around the entire knob with painters blue tape. 2. If you have a new door that has never been painted, stained or sealed you need to prep the surface by lightly sanding with a 220 grit sand paper. Remove the dust with a damp cloth or tack cloth. Prime the door with a water based primer sealer. Don’t be concerned with the way you apply the primer, the top coat will even out the primer coat nicely. 3. If the door has been painted before, sand the surface to remove any gloss so that the paint will adhere, this is referred to as creating tooth. Use 220 grit sandpaper and lightly sand the entire surface. 4. Remove the dust and spot prime any bare wood that was exposed while sanding. Once all the prep work is done, it is time to start applying the topcoat. The type of paint you use is up to you. 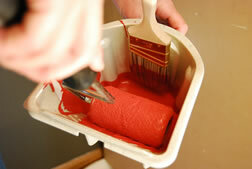 Oil based paints, up to about 10 years ago, were all that most professional painters used. However, latex paint is now being considered by everyone that picks up a brush as the best paint for all painting for several reasons. Paint manufactures have been formulating latex paints so that they resemble oil based products as far as leveling and eliminating brush marks. Latex levels nicely leaving very few brush marks and retains color for years. Latex is also more environmentally friendly because it contains low or no VOC’s (volatile organic compounds) the stuff that makes it so bad for our environment. Best of all, latex paint is soap and water clean up; oil base paints use paint thinner. I decided the door to my garage on the garage side needed a little freshening up so I selected a nice red color for the job. Looks great, but needed several coats! However, for demonstration purposes, it was a great color to use. 1. 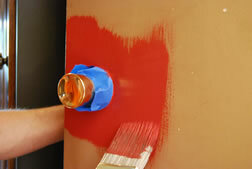 The first step to painting a door is to paint the edge that will be in the room first, being careful to wipe off any paint that has crept around the other side. 2. Next, paint around the door knob if you have not removed it. Just cut in around it then lay off the paint vertically following the direction of the door. 3. Divide the door into two sections, a top and a bottom half. Working on the top half, roll the paint on to cover the entire section to at least past the doorknob. It is best to use a ¼ inch nap roller (for smooth surfaces). It will hold just the right amount of paint and not apply to much texture. I like smaller 3 inch rollers; they cover well and are easier to control. This small pail even has liners that make clean up a snap, look for the Pelican Pail by Wooster Brush at your favorite place to purchase paint. 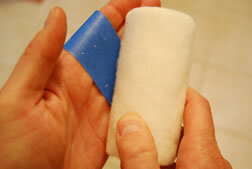 Prior to rolling, use a piece of painters blue tape to remove the loose fibers from the roller. Gently rub the roller with tape, changing out the tape a couple of times. There is nothing worse than picking out roller fibers from your fresh paint. 4. 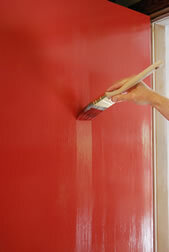 Lay off the paint in upward strokes using a 2 ½ inch wide paint brush. If you paint down, the top edge of the door will grab the brush and you will end up with sags along the top edge of the door. 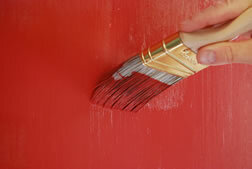 “Laying off” is a term for using a brush to level the paint using light even strokes, working from the center of the door and “laying off” to the top. 5. After you have laid off the top, roll the bottom half, rolling into the top painted area a couple of inches. 6. Lay off from the bottom to the center, feathering the brush strokes into the previously painted area. 7. 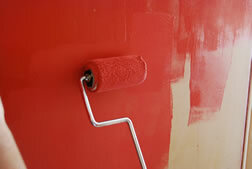 Remove any masking tape before the paint has dried to eliminate any pulling off the paint that has dried on the tape. Stand back and admire, allowing 4 to 5 hours before closing the door. That is a short course on painting a flat surfaced door. I find it best to take your time and try to paint doors when the weather isn’t to warm, or the paint will set up too fast. And on a personal note, red doors are hard to paint, to many coats….. Never again.